When you sail around the crystalline waters of Ibiza and see its gorgeous coastline, you'll wonder why you didn't do it before. The best way to do it is to charter a boat so you can sit back and relax and have it all done for you. Boats Ibiza has been going strong for 10 years now and is run by people who really love boats. No surprise then that the company continues to add to its fleet to give its customers the best experience possible. We dropped by recently to meet Captain Lee and take a look at their brand new Sunseeker boat, the Portofino adding to the Camargue and the Predator models from this iconic British brand of hand made sea craft. The boats are made this way because Sunseeker believes that the only way to produce a boat of a high calibre is by the fair hands of its craftsmen; only the human eye can give love to the process. Their formula is simple; they make their boats with "a hawk's eye, expert hands and a devilish attention to detail". That about says it all. The Portofino has lots of space for lounging in the sun with plenty of room to expand the sun deck areas so all can top up their tans. Its height and width are a little larger than other boats of its class, which is ideal for big groups of people. “You get a very good deal for your money, but that's only part if it. We like to treat the people who come out with us as friends - it makes a big difference and it relaxes everyone instantly. " You can literally go anywhere you want with Boats Ibiza, though the most popular choice is the pretty and uninhabited island of S'Espalmador or to Ibiza's sister island, Formentera. Of Captain Lee's recommendations when out in this direction is to treat yourself to lunch at the restaurant Juan y Andrea next to Ses Ilettes beach in Formentera, recently voted the best beach in Europe. “I've always been on the water whether sailing, rowing and surfing; I even had my own speedboat for seven years. The sea is in my blood, so when I got the chance to skipper with the Boats Ibiza full time, I jumped at the chance”. 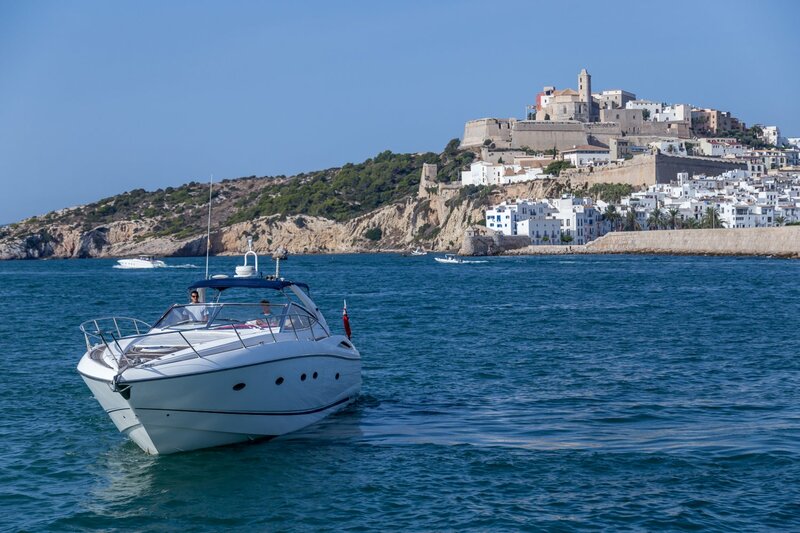 September and October are great months to charter a boat on Ibiza, so if you are about to come, you can still enjoy an excellent day at sea in great weather. The prices are lower too, so if you fancy taking out the new Portofino and have a group of 12, you only pay around €70 per person for a sunset cruise or for the whole day, it is just €170 each. All this and a full fridge of wines, beer and soft drinks. When you book through Ibiza Spotlight and use the booking code SPOT16, Boats Ibiza will even throw in a bottle of Grey Goose vodka for free. Many customers of Boats Ibiza say that their trip was the best thing about their holiday – it's time to discover for yourself.